Extract from the OS 6-inch map of 1869. Map - Distribution of Early Historic and Medieval sites and artefacts. 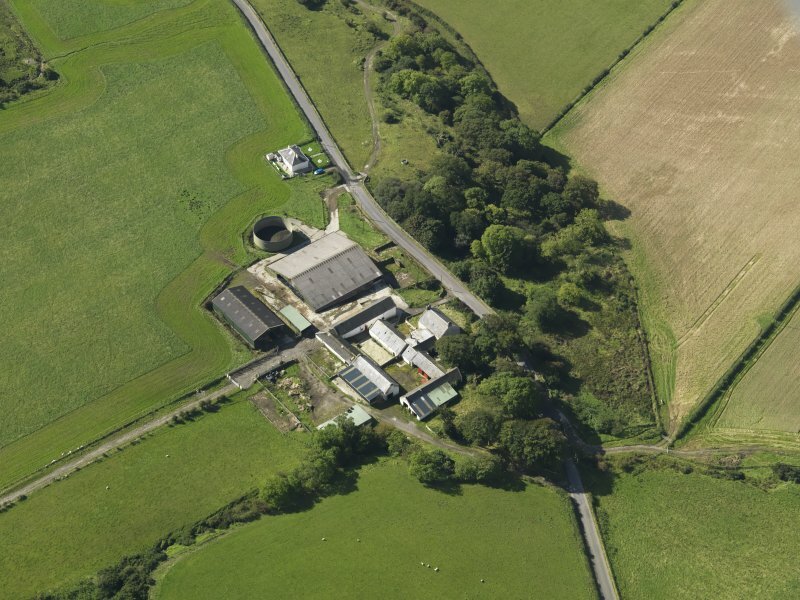 Oblique aerial view centred on the farmsteading, taken from the NNE. rock. This castle, which consisted of several towers and buildings, was the residence of the Jamiesons of Kilmorie. Kilmory Castle (name verified) comprises the remains of three sides of a building which are 4.8m by 3.8m by 1.5m. Its crude unmortared walling, now up to 2.0m high, is 1.0m thick. On the W corner a round annexe, 1.5m diameter within walling 0.6m thick and 2.0m high, has been added. The interior is filled with debris so that its origin and nature cannot be ascertained. Visited by OS (TRG) 2 November 1976.
bedrock upon which the earlier building stood was substantially cut down. Archive deposited with Bute Museum, RCAHMS, Mount Stuart archive. Islands Enterprise, Argyll and Bute Council Buteshire Natural History Society; Community Council. T Addyman, K Macfayden and F Boisserie, 2007. 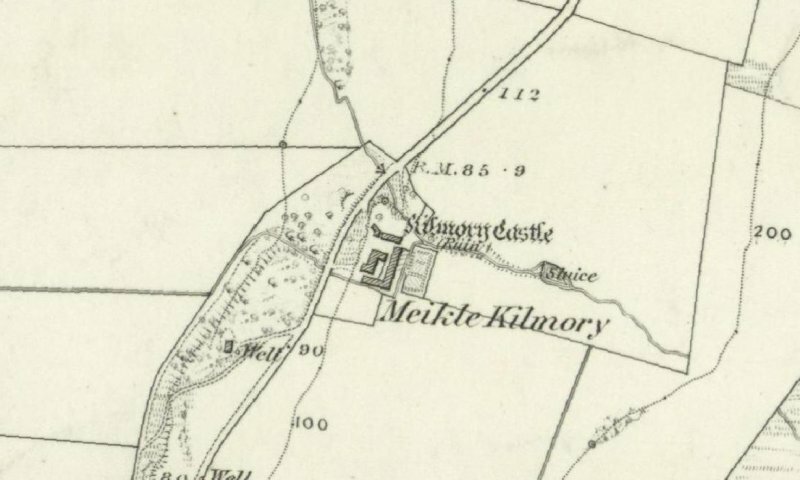 Kilmory Castle is situated on the N side of Meikle Kilmory farmstead (NS06SE 397) and it remains as previously described. The earliest depiction of the ruin is on an 18th century estate map (May 1780-82); it is also shown on the 1st edition of the OS 6-inch map (Buteshire 1869, Sheet CCIV). Visited by RCAHMS (GFG) 7 May 2009. NS 0507 6117 A formal survey to stone-by-stone level of detail was undertaken during August 2007 of the surviving masonry of this fragmentary ruin. 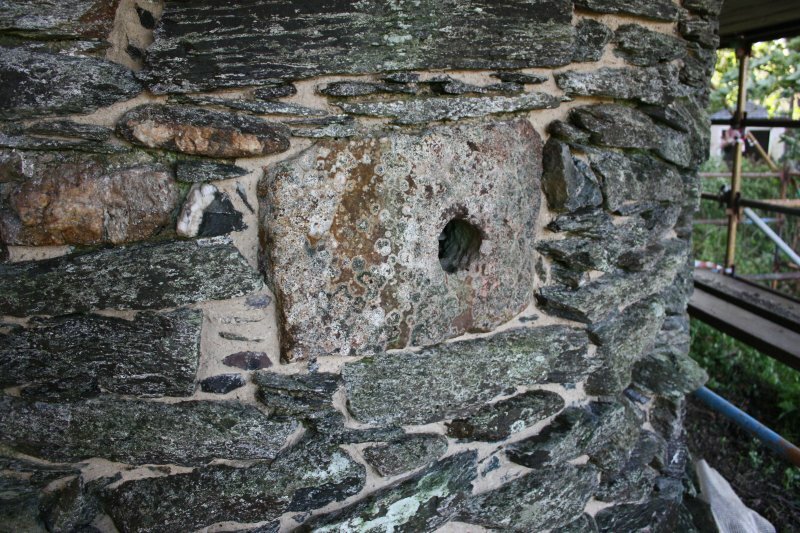 It consisted of two main periods of work, the first consisting of the SW corner of a substantially built structure with clay-bonded walls pointed in mortar - perhaps a small fortified tower or substantial laird's house. To this was appended a small sub-circular turret; the surviving lower story of this structure is detailed with three pistol loops of dressed stone. This level of the tower must have been accessed from the floor above. The building was heavily impacted by the construction of an improvement period farmsteading, Meikle Kilmory Farm. The bedrock upon which the earlier building stood was substantially cut down. Funder: Discover Bute Landscape Partnership Scheme partners: HLF, SNH, The Mount Stuart Trust, Highlands and Islands Enterprise, Argyll and Bute Council, Buteshire Natural History Society, Community Council. 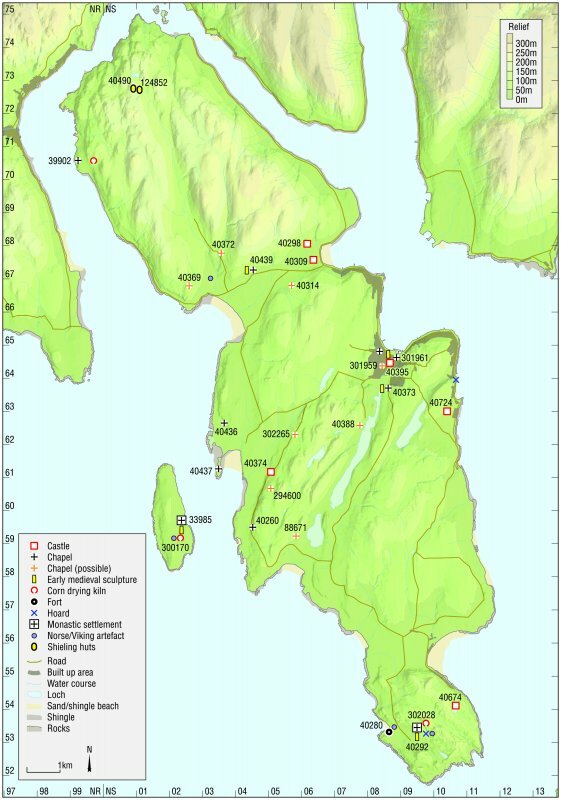 A programme of works was undertaken August 2010–March 2011 at Kilmory Castle as part of a four year programme to consolidate the scheduled ancient monuments on Bute. The planned consolidation forms part of a wider programme of landscape enhancement facilitated by the DBLPS. Consolidation works were undertaken in three main phases: the replenishment of the clay bonding and lime mortaring of the castle walls; repairs to the soft topping of the walls (both undertaken by Little and Dave Construction/Arc Architects); and the monitoring of topsoil stripping from a c35m E–W by 20m N–S area to the immediate to the N of the scheduled area around the castle. Archaeological recording by Addyman Archaeology in 2007 had produced a comprehensive survey of the standing remains. No additional information was recorded during the consolidation works. The removal of the topsoil revealed a large dump of beach derived sands and gravels. Although archaeologically sterile, these were judged to relate to the construction of the post-medieval farmstead that now occupies most of the site.